If the surface of a hardwood floor is badly worn, a cleaning and re-coating will not be sufficient to restore the floor. In this situation, a full sanding and re-coating may be required. Our hardwood crew will sand the existing finish off and re-coat the floor with polyurethane, restoring the floor and bringing back its natural beauty. Oil based, or quick drying water based finishes are available. 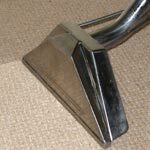 We also offer the “dustless” sanding process. We recently restored this pine floor for a customer in Guilford. What a difference!